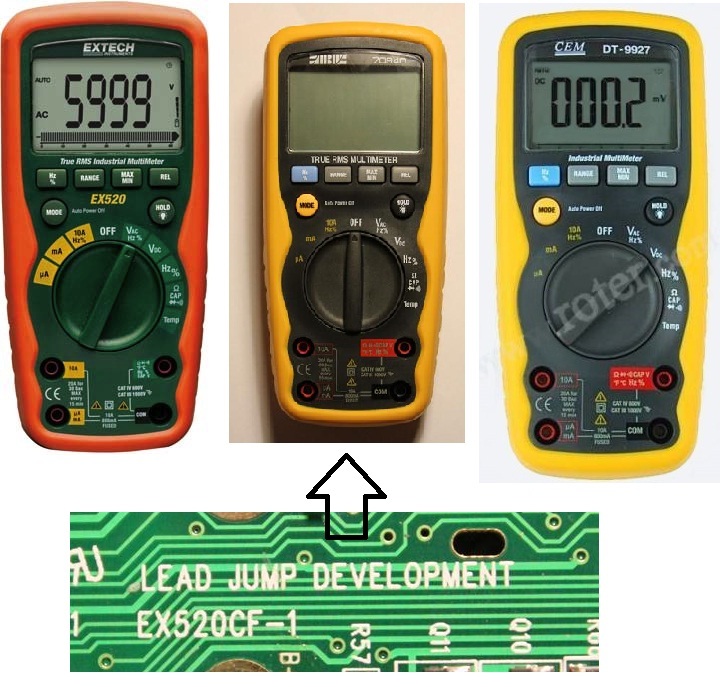 Re: Fluke 280 Series True-rms Logging DMM VS Chinese Clone !! I had been looking at CEM before but I never saw this one. A test would be great....hehe. Maybe a 287/289 and DT-9978/9979 Head on head duel. They have vision but you do not gain fame with just Hollywood style videos, or by making copies of others companies design. The companies that I knock their door, haves products with genuine original ideas. If you are so passionate about a Fluke 287/289 , it makes more sense to chase one on ebay. Yeah I know that you didn't fave it, but it honestly looks interesting if it works. IP67 rated, Bluetooth, graphical display....even a bit more than the Fluke. It is a bit of a shame that they copied the Fluke design. They could have build their own design and I am sure it would be a lot easier on the market, because most people see it as a Fluke clone now and stay away because of that. The Metrix MTX is quite often on German ebay at the moment. They are about 150Euro which is very fair I think. One last word about pricing of Asian products, they do not come cheap !! And if the device looks shiny, the price is shiny too. and so the first whole seller who will get the first products at hand from them, he blast the prices sky high = no competition yet. I know everything related about Fluke pricing in Germany and in all EU. UK haves a bit lower pricing, but not close enough to what happens at the other side of the pond. The CEM page about the product looks poorly made, no info about the rest parts, like software or IR-modem or what ever. They build it, but they do not support it as it should for international sales. If I was Chinese, I would had less second thoughts about getting one. But I am not !! Yeah I understand what you say. It depends a bit on the company. Some sell to private and in small amounts and that's not a bad way, too. I got some Photografphic Equipment directly ordered from the manufacturer in China. As you said it was not "cheap" but still a lot less expensive than our european or american counterparts (They design and develop on their own). To take it short, excellent build quality, very kind service, fast and helpful. With my European Ballhead I had less good experience. It#S OK but overpriced (Designed in Switzerland, made in France). Factory made scratches and notches. No service at all (they really don't have a service line or email but offer you two years warranty). A friend of mine was obsesses with this european company (one of the leaders and pioneers in photo-hardware) but fell down quick. Malfunctioning Ballhead, was searching to find a service line and got one by the German main reseller, called them and was told they call him back because there was no native english speaking Person at the office (huh). got his call after three weeks and they told him to open the Ballhead and fix it on his own....... So much about european premium quality stuff. The chinese stuff has a dent or a screw missing and they send you a new item for free. That's service I expect and if I pay half of the price for an equal product...why not . Voltcraft is distributed by Conrad Electronic (one of our biggest electronics suppliers around here) and they just rebrand them. I have a Voltcraft DMM since 12Years in use and it's not bad at all. I do understand your concept, I really do . Well I am fan of all the planet , and I do have Chinese friends. Even so, I hate copies, and I hate the phrase: Build for a price ..
and they do not invest about long term partnerships. If I have become expert and respectable in my village , it is an result that came of my own determination / hard work / and dedication. And when I discover people or companies with those high standards, I need them next to me as friends, no matter what. The CEM units all look suspiciously like ExTech units Pretty certain they are one of the OEM manufacturers for ExTech. Check out their other models and the corresponding ExTech units - the only difference is the case colour. Yes, They seem to produce for others as well. As I mentioned Conrad electronic (Voltcraft). They seem to have a webshop, but it doesn't show all Products. I have been curious and asked for the price of the Logging DMM. I can not spot such visual similarities with Extech products, its best to add model numbers at list. Or to add pictures . Extech EX505 and CEM DT 9915 are there. If you do not take it apart !! Hehe, yeah, to be sure you would have to take a look on the inside, but even then it could be a 1:1 clone. As I said, my brother uses the Voltcraft Automitive DMM which seems to be a CEM and it works very nice. If they sell on their own I doubt they would keep a very high quality control standard because it's more expensive. The CEM with True rms are the 9917T, but there is no actual picture of it. try to read the text on the top of this display. My Sidchrome meter has EX520CF-1 labelled in a few locations on the PCB. Also watched a youtube video of someone tearing down an EX5x0 model and the internal design is identical. In any case, they're not crap build quality like the cheap chinese knockoffs. The waterproofing design is actually pretty good. Couldn't find a photo of the 9927T model which has true RMS. It also seems like CEM have switched from yellow to blue colours? Hey metalphreak get this too for your picture collection ..
And the point here is not the quality level , but who gets what and from whom. I just found that the Japanese sanwa uses probably identical LCD display, that came from the same shop that Agilent got their display for the Agilent orange series. I found a Manual of the CEM logging Multimeter online for those interested. Achilles send me with one PM, the link of your reseller if possible, just for my personal collection of links.